You may have seen an earlier video I made some time back now about using Knit Stay tape when sewing double needle hems on stretch fabrics. This video was really more about the double needle than it was about the stay tape. It's here in case you missed it. It's something I use a lot and I think if you sew with stretch fabrics, it's a really good tool, so let's look at it in more detail. On stretch fabrics, or could also be used to stabilize a bias seam on a woven or delicate fabric too where some ‘give' is needed. Use to prevent stretching or give the stretched fabric a bit of support and rebound. To create a nice sharp edge when it might otherwise be difficult to do this on a knit, because they often don't press well. In the shoulder seam to prevent long arms from dragging the seams down. Around the hemline to make it easier to sew. Along necklines and other fabric edges. To prevent difficult to work with knits from curling at the edges. You can buy it in white, black or ivory. It comes on a 25-yard roll, 1/2 inch wide, is fusible on one side and will be sent from the US. Sadly due to the cost of international postage these days, it can only be sent to US addresses. Thank you for your video. I am a beginner and thought I had to buy a special machine to achieve that finish! I am so thankful for your website! I am learning so much and I love your patterns! Hi Stacy, fixed the video. Not sure what happened. Thanks for letting me know! Thanks for all your patterns and videos. I do know about stay tape but have to confess I never use it but there have been times when I certainly should have! But after reading about it and watching your video I’m going to order some right now! What foot did you use here? is it normal universal foot? But that’s the thing…”Vlieseline Formband” isn’t stretchy…which makes it suitable for stabilasing shoulder seams, but not hems or other seams on jersey that need to remain stretchy. Freudenberg (the company that makes it), sadly doesn’t produce anything comparable to knit stay tape. The closest you can get is by buying the H180 and cutting your own bias strips with a rollcutter. Hi! Thank You for sharing! Do You have any suggestions from where I could buy this stay tape (preferably on-line and from Europe)? Super video as always by you Deby. Thank you! 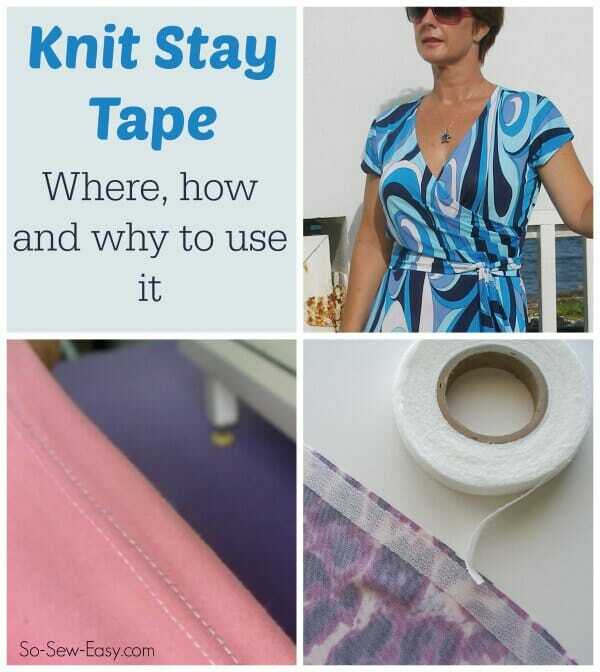 Thank you for this easy-to-understand video on using knit stay tape. Hi Diana, please have a look again. I have no idea how that video got switched to private but it is public again now. Thanks for your note informing me of this. I love So Sew Easy. Good job. So many good tips and ideas. My local store does not sell this tape, but Amazon has Knit-N-Stable tape from Pellon that is 1 inch wide. How wide is the tape you are using? Thank you! The one in the the photo is 5/8′ wide. Thank you for a great video with useful guidance on stitching jersey with a double needle, but the link in the video leads to an unavailable product listing and I can’t for the life of me find any fusible stretchy stay tape in the UK: shop assistants think I’m mad when I ask for it, but it’s such a useful product for people who sew, why isn’t it more widely available?! Help, please! Hi, we had some issues with the last supplier we recommended. I’m looking for a new source right now. I’ll be sure to let you know when I find one. That would be wonderful, thank you. I am trying to nail down the details of some tape I have found on eBay, so I shall likewise report back if I have any joy (fingers crossed!). Thanks and please do let me know! Thank you for putting a link to the Dritz 1/2″ Stay Tape on this page. I have found it available in the UK but it is actually cheaper to buy it from the US, especially if you order more than one roll! I have been making do with fusible interfacing that I have to cut down to a narrower width, which gives an acceptable finish for my own clothes (jersey hemmed with a double needle), but it isn’t ideal and wouldn’t do for a garment for someone else, so I am looking forward to trying out something that comes recommended by So Sew Easy. Use the tape when you are hemming, around the neck, and sleeves. Use a twin jersey needle, sometimes I use a walking foot. Follow this tutorial, it is a very nice free pattern and the steps by steps photos will help you feel more conformable tackling jersey fabrics. I was taught to sew baby knitting yarn into shoulder seams in knit fabrics to stabilise them. I am looking for fusible knit stay tape but cannot seem to find it. I am in the US. WE NO LONGER HAVE THIS ITEM AVAILABLE< SORRY GUYS! I have been trying to find something similar in the uk. Not found any tape but … I have found this interfacing on Amazon – just about to order some and try it. I will need to slice it into strips to make tape, but this shouldn’t be too hard with a long quilting ruler and a rotary cutter. I have also been looking to find this in the uk without any luck. I have been using the swimwear clear elastic instead. It’s not as thin as the knit stay tape but works great as well. Meanwhile, if anyone knows where we can find knit stay tape in the uk, please let us all know! Do you know the name of the brand or manufacturer? That would be helpful for me, I’m trying to find a company that sells stay knit tape in Europe. I wish I did. We’ve had the sewing chat group looking all over and no one has been able to find a similar product in the UK or Europe. Sorry. Hi Deby, I love the idea of the staytape. I used the double sided hemming tape but would like to get the one you used.i live in Australia so cant get it from you, I have found staytape at Punch with Judy. She has straight and bias which one do you think would be best to buy. I use the plastic stretch tape for my shoulder seams and I also have cotton tape but not sure of the right places to use them. Lots of questions sorry about that. Love your patterns and site. Ideally you’d want to get one specially designed for working with knit fabrics. I think even a bias stay tape would be too stiff to use on hemlines and necklines, but ok for where you didn’t want any stretch, like the shoulders. If you can get a fusible tricot interfacing, then you could cut some thin strips of that to use in place of the knit stay tape, but it would be a bit fiddly. I’m still trying to arrange for overseas shipping, but it’s so expensive! I agree with Robyn. I get glazed over when I look at all those tapes! Hi Deby , I managed to purchase some fusible tricot interfacing for knits from Spotlight here in Australia. Now I will be able to do the hems properly. It is in 3 metre lengths and was around 18 Aud. Just thought I would let you know so all the Australian people that follow your blog can get it there. It will have to be cut but that will be easy. I love using the stay tape on the curved hems of knit tops. I have also purchased it in 1/4 inch and use it with “slippery” fabrics when I need to sew a small hem. It makes it so much neater looking-no wavy edges. I love it! I would like “thanks”! Thanks for all your detailed info and freebies! I have sewn for years, but I have learned more from you in just a few short months by reading your blog! And thank YOU Kathleen. Great to have you following along. I like the idea of the narrower one for slippery fabrics. I’m determined to try chiffon this year. We could do with a wash away version – maybe I’ll find something that works just right. Would this product help in stabilizing a flat feld seam in a pair of stretch knit pants? My first attempt at taking the riser seam in at the seat puckered even though I double stitched. Hmm, not sure, but it would certainly keep the fabric flatter and more stable so around that curve, it just might work! Thank you. I’ll see if I can find a similar product here and give it a try. Do you know of any suppliers that will ship internationally? Not at the moment Misha, but I’m working on it for you all. I have used Stitch Witchery in the past with great results. Is the Stay Tape the same thing? Long before the stay tape was available I always used stitch witchery tape. It will stretch enough so seams won’t pop. I used to sew it to my hem edge first, then turn and press using a damp press cloth. Just do not let it hang off the ironing surface when it it hot because it will stretch out of shape. When applying it to a curved edge, I stretched the stitch witchery tape as I sewed it in order to ease the seam. Wonderful for circle skirt hems.